Trying to keep up with diet trends is enough to make your head spin. As if life isn’t busy enough already, we’re supposed to keep up with the low-fat, low-carb, no-carb, organic, grass-fed, vegan eating plan of the moment. Well, if you choose to buy into diet trends, we can’t help you keep them all straight. What we do have for you is a few of the foods that used to be major no-nos, but are now resurfacing as foods to include in a nutritious diet. Sarah-Jane Bedwell from Self’s “Eat Like Me” blog explains five of these healthy and yummy foods, and why we should toss the rulebook out the window and make room for them on our shopping lists. 1. Eggs – These little guys were once banned from the world of healthy eating due to their cholesterol content, however, new research shows that one egg yolk per day is fine for most people, as long as their total cholesterol intake for the day comes in at 300 milligrams or less. To put this in perspective, one large egg yolk has about 185 milligrams of cholesterol; egg whites are cholesterol free. So why should you include them in your breakfast rotation? Well, one egg contains only about 70 calories and provides a plethora of nutritents such as protein, vitamins A and D, B vitamins, and lutein. Scramble one egg with one egg white and serve with a slice of whole grain toast and fruit for a breakfast that will keep you full all morning! 2. Avocados and Nuts – Once thought to be too high in fat for a healthy snack, we now know that the heart healthy fat found in avocados and nuts can promote weight loss by increasing satiety and lowering bad (LDL) cholesterol. Even more, they both are a great source of fiber and antioxidants, and nuts provide protein as well! Try to keep your portion of nuts to ¼ cup per day, and pair with a piece of fruit for an afternoon snack. Also, slicing ¼ of an avocado and tossing it in your lunchtime salad will incorporate some healthy fat and help keep you satisfied. 3. Beef – Beef was given the cold shoulder as it was thought to be too high in fat, but there are actually 29 cuts of lean beef! Now that we know better, beef can certainly be included in a healthy diet as it is full of protein, iron, zinc, and B vitamins. Feel free to throw a sirloin steak on the grill and round out the meal with some broccoli and a baked sweet potato, or build a healthy burger out of some 90/10 lean ground beef. 4. Pasta – Ditching pasta because of its carb content sounds miserable to us, and we’re sure that you agree. 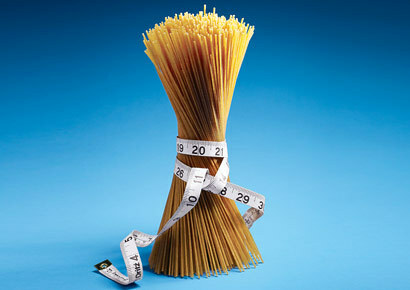 In actuality, pasta is relatively low in calories, and if you opt for whole grain pasta, it’s also a good source of filling fiber. Something else to be happy about? When we eat carbs, our brains release seratonin, the hormone that helps us to feel relaxed and satisfied. So if you’ve had a stressful day at work, scoop out a ½ cup serving of whole grain pasta and make it a meal by adding vegetables, marinara sauce, and a lean protein like chicken or shrimp. 5. Shrimp – Years ago, well-intentioned doctors told heart patients to avoid this succulent little sea creature due to its cholesterol content. Now, we’ve smartened up and are aware that it’s not the cholesterol in food that raises our blood cholesterol the most, it’s the saturated fat. Shrimp are actually very low in fat in addition to being high in protein and other nutrients like zinc. Shrimp with cocktail sauce makes a great appetizer that will definitely take the edge off your hunger and keep you from overeating at dinner. For more fun facts about food, take a look at the Academy of Nutrition and Dietetics website atwww.eatright.org, and be sure to check out Self’s “Eat Like Me” blog athttp://www.self.com/fooddiet/blogs/eatlikeme. If you have any questions or would like to schedule an appointment with one of our Registered Dietitians, feel free to contact us by phone or e-mail, or leave us a message on Facebook or Twitter!